Dr. Jesse Meik, one of Tarleton’s herpetology professors, is buried deep in research over snakes he found in Mexico. In fact, he is working on research to properly define one species of rattlesnake and four species of vine snakes for scientific journals by the end of the year. 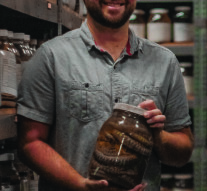 Dr. Jesse Meik holds a jar of preserved specimens of the rattlesnake he is researching. Meik’s research on speckled rattlesnakes found on an island in the Sea of Cortez in Mexico is extensive. He said that the evolution of this species is rare, and the process has been quick when considering the thousands of years it usually takes for a species to evolve and diverge from its ancestors. Meik explained the evolution of this species of rattlesnake this way: Before the Ice Age, there was a mainland on the west coast of Mexico that was home to speckled rattlesnakes. After the Ice Age, a part of the mainland broke off and became its own island. Because of this, some these rattlesnakes were secluded on the island. The rattlesnakes evolved and dwarfed over time, becoming essentially miniature versions of the original rattlesnakes from the mainland. In time, a different species of very large rattlesnake—ones Meik described as “the King Kongs of rattlesnakes”—from a nearby island swam across the water and bred with the dwarf rattlesnakes. In turn, a hybrid rattlesnake was created. This dwarf, hybrid, speckled rattlesnake is now what lives on the island. These snakes are evolved enough now that they are experiencing variations and mutations within their own species. 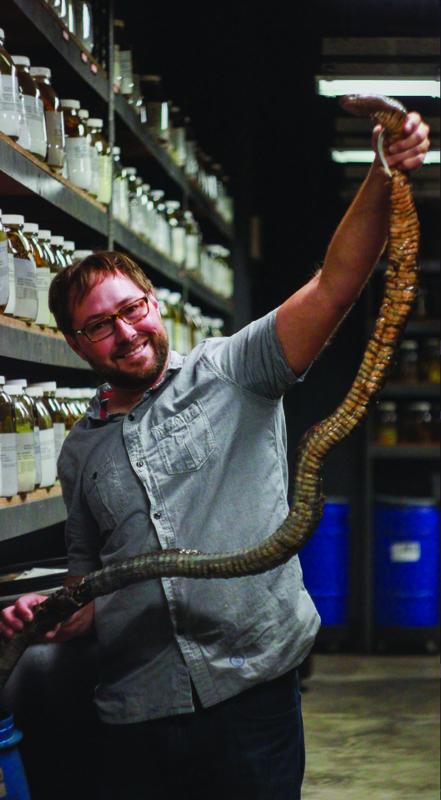 Dr. Jesse Meik poses with a preserved specimen of Texas’ largest known species of snake, the Blue Indigo. 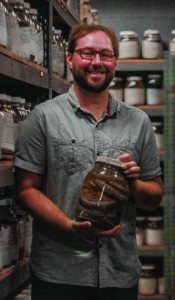 Meik believes that his research will prove that this dwarf, hybrid islander speckled rattlesnake is a species of its own and deserves to be described as such. He also said that it is not an easy process. “This is really unique and interesting among new species, because it’s very, very rare to demonstrate—very difficult to convincingly demonstrate—what we would call ‘hybrid speciation invertebrates.’ I think this is really unusual in that this is what it is,” he said. From 2001-2004, Meik traveled back and forth between Mexico and Texas, gathering research on what he thought might be one new species of vine snakes. After years of DNA research—including collecting specimens, tissue samples and re-reading research papers from over 100 years ago—Meik and his team will be finalizing documents by the end of the year defining four different species of vine snakes found in western and southern Mexico. However, his research proved that the initial separation of two different species actually turned into an entirely different project. “A lot of times when people think something is close, usually it’s its closest relative, and that’s how it turns out. It’s [usually] a question of whether it’s different enough to be a species or not—that’s usually what you see. In this case here, this was a whole, completely unrelated lineage,” he said. Meik planned to come home with research that proved there is one species of snake apart from the existing species. He was expecting to show the world that there are, in fact, two separate species of vine snakes. 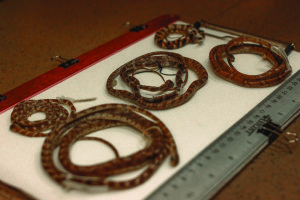 Pictured are five species of the six blunt-headed vine snakes Meik is researching. Four of these five vine snakes pictured are closely related and will be defined by Meik with scientific journals by the end of 2015. However, he realized through DNA research that he has four closely-related but separate species of vine snakes. Apart from those four, he also said he collected two species that are separate and unrelated to those four. This means that Meik came home with a total of six species of blunt-headed vine snake, rather than the originally planned two. For nearly 100 years, these six species of vine snakes have all been considered the same. Because of Meik’s research and break-down of each specimen’s DNA, he has proven that none of these snakes are the same species. “People a hundred years ago thought they were different, then somebody came and said, ‘No, those are all the same.’ Now, we’re coming back. They weren’t able to distinguish them,” Meik said. All in all, Meik found multiple new species of vine snakes and one species of rattlesnake that defies the odds. He said that each of these species should be described and officially named in scientific journals by the end of 2015.